The USFS's proposed Devils Trout Project would effect 2708 acres of forest timber, much of which is along the Gunflint Trail, from the Gunflint Pines to just northwest of the Trout Lake Road. Over half of the timber in the area is scheduled to be clear-cut, some timber would be thinned and a small portion crushed or burnt. While the Gunflint Scenic Byway's Forestry Committee felt that the USFS's proposed project gave at least some recognized toward preserving the scenic quality of the Gunflint Trail, the Committee felt that the Project, as proposed, did not go far enough in protecting the Gunflint Trail. The committee was also concerned that the Project’s reforestation plans were inadequate. Even with the temperature hovering in the fifties, dog musher participating in the 1st Annual Mush for a Cure had what they called a "good run." The musher starting at the Round Lake Road then followed the snowmobile trail down to the west end of the Banadad, down the Banadad and on to the Moose Trail to the Poplar Lake Public Landing a distance of thirty miles. The Mushers stated that there was stilling plenty of snow remaining on the Banadad. The trip was to end at Poplar Creek Guesthouse B&B, but the slippery icy conditions on Poplar Lake made running across the Lake to dangerous for the dogs so the mushers and dogs were trucked around the lake to the B&B. The mushers and handlers then spent the night at the B&B. The event was organized by Voyageur Canoe Outfitters partnering with Black Magic Kennel. According to race organizers, the dog sled run was not a race but "a journey that we hope will become a tradition; a tradition of mushing for a cure for breast cancer on the Gunflint Trail." Mushers who participate in the two-day event raised donations and pledges for the National Breast Cancer Foundation. Mush for a Cure is an extension of Voyageur Outfitter's Pink Paddles' program. While all the funds collected by the mushers have not been totaled yet, according to Mike Prom, Voyageur Outfitter it appeared to him that this event, despite the warm weather, was successful in raising $2500 for the Cancer Foundation. Two Wisconsin men spend their first day of spring skiing the 30-kilometer Banadad Trail. With the morning temperature hovering at thirty degrees, David Gorski and Mark Balhhorn started at the west end of the trail. They said that the first part of the trail was very fasts and they made good time but as the temperature began to rise and the snow softened the skiing was a bit slower. Their time for skiing the entire trail was four hours forty five minutes. Both agreed the trail was still in good shape. The pair were staying at the Boundary Country's Little Ollie Cabin. While there is still at least another week of good skiing along the Banadad's eastern end near the Poplar Creek Guesthouse B&B and Cabins, these two skiers maybe the last to ski the entire trail for this season. In a letter issued on February 9, 2007, Dennis Neitzke, Gunflint Ranger, Forest Service (USFS) announced that the Devils Trout timber management project along the Gunflint Trail, he approved last summer, has been rescinded. According to Forest Service officials, the Project was withdrawn because of a minor technical problem. The Project after it was withdrawn was then re-issued. Which means that now interested parties can once again comment on the proposed Devils Trout Project. The USFS will accept comments on the re-issued Project up to about March 23. For more information or to get a copy of the proposed Project's Environmental Assessment call 387-1750 or stop in at the Gunflint Ranger District in Grand Marais. Under the Devils Trout Project some 2708 acres of forest timber, much of which would be along the Gunflint Trail, from the Gunflint Pines to just northwest of the Trout Lake Road would be effected. Over half of the timber in the area is scheduled to be clear-cut, some timber would be thinned and a small portion crushed or burnt. The Gunflint Scenic Byway's Forestry Committee felt that while the proposed project gave at least some recognized toward preserving the scenic quality of the Gunflint Trail, the Project did not go far enough in protecting the Trail. The committee was also concerned that the Project’s reforestation plans were inadequate. The Committee concerns were submitted to Neitzke as comments. In issuing the Project's initial decision to proceed, last summer, Neitzke summarily dismissed all the Byway Committee's concerns. At the last Gunflint Scenic Byway meeting the Byway's Forestry Committee was directed to again present their concerns to the USFS on the Devils Trout Project. The forestry Committee is hopefully Neitzke this time will give a little more thought to the Committee’s concerns. 387-1750 or in person. The project leader is Amy Wilfahrt at (218) 387-3211. • Email comments must be sent to comments-eastern-superior-gunflint@fs.fed.us. must contain "Devil Trout EA" as the first words on the subject line. Business hours for hand-delivered comments are Monday – Friday, 8:00am – 4:30pm local time. 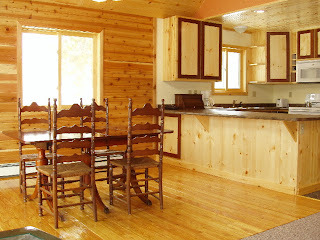 New two-bedroom cabin overlooking year-around-flowing Poplar Creek now available. The cabin, Poplar Creek Retreat, accommodates up to six people and includes a fully equipped kitchen with dishwasher, freestanding LP fireplace, electric heat, clothes washer/dry, four-season front porch and side deck. Each of the bedrooms has their own private bath with showers. The second floor bath has a whirlpool tub. From both bedrooms front windows there is a great view of the creek. Other features include; firepit, charcoal grill, private picnic area and phone. The creek begins at the Little Ollie Lake and the Lake is just a short walk from the cabin. A canoe comes with the cabin. In the winter the road is plowed, so you can drive to the cabin. Groomed ski trails with connections to the BWCA longest tracked trail the Banadad and the Gunflint Nordic Trail System along with six miles of snowshoe begin at the cabin's front door. The first weekend in march the mid-Gunflint area where Poplar Creek Guesthouse B&B is located, along with most of the rest of the state, received this winter's biggest snow fall to date- ten to twelve inches. Then yesterday another four inches of snow was received. The measured total snow on the ground is currently twenty four inches. It is finally beginning to look like winter. With this new snow the ski trails are all in great shape. March compared to last month's lack luster performance is off to a good start. During the whole month of February only 4.7 inches of snow fall was recorded in the mid-Gunflint area- the lowest amount for that month since 1998.